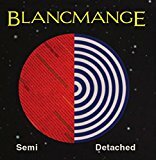 Semi Detached is ranked 4th best out of 10 albums by Blancmange on BestEverAlbums.com. The best album by Blancmange is Happy Families which is ranked number 11067 in the list of all-time albums with a total rank score of 122. The tracks on this album have an average rating of 77 out of 100 (all tracks have been rated). Related links: top tracks by Blancmangetop tracks of the 2010s, top tracks of 2015. Showing all 2 ratings for this album. The best album (so far)of Blancmange Mk II. Modern synth-pop in a retro sounding way with Neil Arthur's vocals familiar but better. In fact probably Blancmange's 2nd best album after the debut. A cover of a Can song (I want More), a trademark light hearted (lyrically) Useless, an 8 minute opening track....this is perhaps their most diverse album.